Archive by category "Costa Rica Fishing Articles"
for the better part of the year, the rivers running into the Caribbean side of Costa Rica look like coffee with cream because of the runoff, mostly from the volcanoes. The San Juan, which borders Costa Rica, Rio Colorado, Tortuguero and Parismina river mouths have become famous over the years for catching tarpon. The coffee-colored freshwater floats on the surface of the saltwater and brings nutrients to the sea that start the chain of life. The surface water looks dirty, but a couple of feet before the water is Caribbean clear, and fish have no trouble seeing to feed. As the river water pushes offshore, it collides with a current and forms a horseshoe, leaving and coming back to shore. It is as if nature had drawn a line with dirty water on one side and Caribbean emerald on the other. One side of the current will usually be flat as a pancake and the other like a washing machine on gentle cycle. Baitfish gather on the current, and the predators move in to feed. Captains fishing the current will usually stop about 50 yards on the clear side of the current and drift back toward it. The bait of choice for years was the old Porter Sea Hawk, and bucktail and plastic jigs. In recent years, sardines, which are jigged up on small gold hooks, have become very popular. Rolling tarpon always gets an angler’s adrenaline pumping. Photo via Pesca sabalo. A seasoned angler from Florida worked his jig just outside the rip. Tarpon rolled on the surface nearby and the adrenaline level was rising. Finally, a tap on the line and then the rod doubled over. The angler drove the hook home and line began to scream off the reel. He was expecting to see his line head toward the surface, as it does when a tarpon takes to the air. Instead, it dug deep and he felt that old familiar head shake. He gritted his teeth as he grunted out, “It’s a #+#*#*## Jack!” Thirty minutes later, he had a 35 lb jack next to his boat that he considered a waste of time — he could have been pulling on tarpon. Jack Crevalle are often referred to as head-shakers, bulldogs, thumpers, or the not-so-tactful words chosen by this angler because of the way they fight when hooked. They are found on both coasts of Costa Rica. For a seasoned angler used to fishing in saltwater, they might be considered a trash fish, but for a vacationing angler from somewhere in the midwest, they are one hell of a battle. I truly believe if they jumped and tasted better, they would be right up there on the top of the game fish list. I remember when I was about 8 years old, when my little brother and I brought home a stringer of small jacks we had caught. My mother cooked them for dinner. I never kept another jack, although I did have one prepared by Clifford the chef on the Rain Goddess years ago in Barra del Colorado that was excellent. Local Costa Rican fishermen eat them regularly. I’m sure they know something my mother didn’t. Jacks are ferocious eaters and fighters. They readily hit a live or dead bait, jig, popper, or almost any type of artificial offering. The Atlantic jack crevalle grows larger than its Pacific counterpart. They can grow to over 60 lbs; the Pacific species can obtain a weight of nearly 40 lbs. They are for the most part an inshore species but have occasionally ventured offshore. 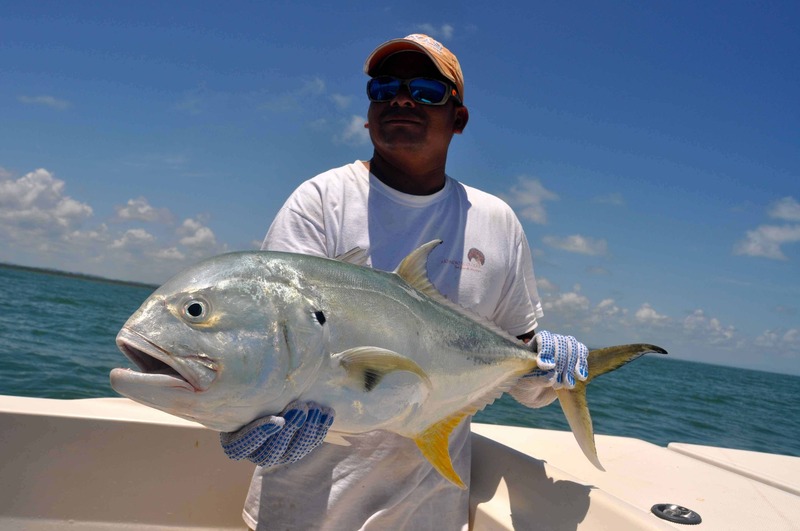 If you are fishing tarpon on the Caribbean, or roosterfish on the Pacific coast, you are more than likely going to encounter a Jack crevalle. If you are dealt a hand of a pair of jacks or better, you’ve still had a good day of fishing. Do you want to know something that might shock you about fishing knots? The “100% fishing knot” is a myth. Yes, simple physics is the reason why. Pretty much all knots will create a weak point on the line given that it creates a point on the line where a max load is hitting it from more than just one direction. And although there are some instances where the main line (or leader) will break before the knot fails, there is no single knot that can always do that with all types of lines. And if you hear someone say that their knot is 100% without any exclusions, then they likely have never tested it out in a controlled test with multiple lines, so I be wary of their recommendation. This is simply due to the fact the contorting line and creating hard turns that get put under tension will always create a weak point in the line making it the weakest point in the system (assuming that the main line is not compromised). Note: This weak point is almost always at the first hard turn in the top section of the knot coming from the main line, so it most often leaves a clean break which looks like the mainline simply snapped when an angler examines the line after a break-off. 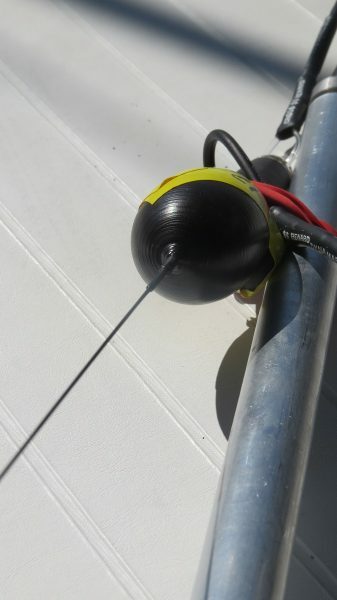 Now that we’re past the first hurdle (acceptance), step #2 is to actually test our knots to make sure that you don’t lose the fish of a lifetime due using a knot that isn’t the absolute best for each connection in your line system. To help save you time in testing knots, I’ll be displaying results from my continued testing on this page. Do You Know The STRONGEST Fishing Knot For Every Situation? The results of these knot strength tests might surprise you! Feel free to use the links below to skip down to the knot connection that you’re most interested in. Otherwise, you can simply scroll down to see all of the knots. And if you don’t see your favorite knot listed, just leave a comment on the bottom of this post (click here) and I’ll add it to my list of fishing knots to evaluate. A bad knot is very easy to see because it leaves behind the telltale sign of trouble… the curly tag end. Yes, the curly tag end that you may have seen after a break-off means that the knot used was either a bad knot, or there was a poor job in tying a good/great knot. So if you ever see the curly end after a break-off, do not tie the same knot the same way because it’ll likely happen again. The difference between a Good knot and a Great knot requires the act of intentionally breaking them under a controlled test to see how much tension they can hold before the break occurs. This is the missing link that most anglers overlook because it requires time and effort. I am the perfect example of this because I was even fishing tournaments with money and pride at stake and never even bothered to actually test my personal knots. And when I finally did test my knots, I was shocked at the results… the very first test I did revealed that I was getting 30% less strength than I otherwise would have had I been simply using a different knot for my line to leader connection (replacing the Double-Uni knot with the FG knot… both shown below). So I highly recommend testing out your knots. And if you’d like a shortcut, this page shows the results from my testing below to help guide you to the best knots from my many tests done so far. And I’ll continually update this “best fishing knot” post as more and more knots are tested so that you can have the latest and greatest data. So if you want to save time while maximizing your line strength, this post is for you. What Are The Best Fishing Knots? There are many different types of lines which in many cases have completely different textures, sizes, and friction coefficients. And to truly evaluate a fishing knot, it is essential to focus each test on a specific type of connection because a knot that is very good for line-to-line connections is often not good at all for line-to-lure connections (and visa-Aversa). Braided line has quickly become an extremely popular choice for inshore anglers because it allows for longer casts and better feel of lures given that its strength to diameter ratio is so much higher than mono/fluoro lines. Plus, it has very little stretch which enables the angler to feel even the lightest of taps on the other end of the line. But braid requires much for friction within the knot compared to monofilament so it almost always requires a different knot than the traditional knots used on mono. To kick things off, we’ll start with the most important of all connections for most saltwater anglers who use a lighter main line to connect to a stronger leader. This setup is becoming very common because it allows for the overall system to have optimal casting performance (due to the lighter line in the reel) while having a stronger leader line at the business end to hold up to the sharp teeth and/or rough mouths of the target species. Fluorocarbon is the most commonly used monofilament leader these days since it’s known for being less visible in the water while also being more resistant to abrasions, so this analysis is focused on connecting a braided line to a fluorocarbon leader. Pro: Thinnest knot I’ve ever seen while also having the highest breaking strength. Con: Requires a strong cinch before cutting the tags so that it fully locks into place. Note: Only use this knot if tying a braided line to a stronger mono/fluoro leader. Click here to see the first contest I hosted for this connection. Note: If your favorite knot isn’t included, leave a comment below and I’ll test it out and add it to the list. Many anglers like to double the braid by forming a loop at the end of the braid and then tying a line-to-line knot to connect the doubled braid to the leader. In many instances, this does increase the overall line strength for anglers who are using a lighter braid relative to the leader. However, the FG knot tied on a single line has proven to outperform the doubled knot connections in most of my testing. The only combination that consistently beats the single line FG knot is the use of the FG knot to connect a doubled line formed by the Bimini Twist to the leader. Con: Requires a very strong cinch before cutting the tags so that it fully locks into place. This next category is focused for anglers who use braided line and like to use swivels. But it could also be useful if you like to use connect your braided line directly to your terminal tackle (although I do not recommend tying directly to your lure or hook using braid because fish can see it so much better than mono/fluoro… instead, use a ~20 to 30 inch leader in between your braid and lure/hook). Click here to see results from a contest I hosted for this connection. Monofilament line is used by almost all anglers in some capacity, so I’ve done many tests with knots using mono line. For tests that I’ve done for my personal use, I focused on Fluorocarbon line, which is a specific type of mono. Many anglers use Fluorocarbon for their leader material since it’s known to be stronger the less visible than traditional monofilament line. Now that we covered the very important line-to-line connection, let’s dig in to the best fishing knots for connecting our hooks and lures to the end of the line. Note: I’ve specifically focused on fluorocarbon line since it’s the most popular for saltwater anglers… if you want me to test these with standard mono, just let me know and I’ll add it to this post. When fishing with artificial lures, using a loop knot is an advantage because it allows the lure to have more motion in the water which most often leads to more strikes. But the downside is that loop knots are not as strong as snug knots, so that needs to be taken into account when selecting your leader line size and when setting drag. Click here to see the first contest I did with this important connection. When going for maximum strength when having action in the water is not as important, then the snug knot is the way to go because a good snug knot will be a significant amount stronger than a good loop knot. More test data getting added soon, so be sure to bookmark this page! Of the many factors that determine if you land the fish of a lifetime that you hook, the one that we have 100% control over is the quality of the knots that we use. So it’s essential for us to select the absolute best fishing knot for each connection to get the most overall line strength. You have certainly heard the saying, “A chain is only as strong as its weakest link…” Well, a rod, reel, and an angler are only as strong as the knot between them and the fish. There isn’t (and never will be) one fishing knot that can do everything with all line types and connection needs, so make sure to be mindful of the knot options you have for each connection need you have. This post will continually grow over time as knot suggestions come in, so leave a comment below letting us know of any other knots you’d like us to add to this analysis. Note: The * symbols next to the knots listed above are the ones that I personally use for each of the respective connections. The tests have been done using 10 to 20 lb PowerPro tied to 20 to 30 lb Ande and Seaguar fluorocarbon. 2. What Is The Proper Drag Tension To Use For A Fishing Reel? P.S. – If you think your angler friends or fishing networks would enjoy seeing this, please Tag them or Share this with them. Tough guy of nearshore reefs, rocky headlands and sandy bays, roosterfish — iconic game fish of the Eastern Pacific — is a bucket-lister for many anglers. A lazy swell rolled in from the open Pacific, gradually forming into a single cresting wave as it encountered ever-shallower water. Our panga steadily chugged along at little more than a walking pace just behind the surf line, so close to the verdant jungle backdrop that I could see flocks of scarlet macaws browsing on sea almonds. Beaches such as this offer prime real estate for predators to pick off smaller fish that dart about the turbulent water to feed on the countless shrimp, sand eels, shellfish and other tasty tidbits revealed by powerful wave action continually scouring the sandy seabed. An open beach off Panama’s Coiba Island is not a great place for a lone blue runner to be swimming, especially one bridle-rigged to a circle hook. Certainly the fish so tethered at the end of my line was not having the best of days, and a sudden increase in activity telegraphed up the rod told me things were about to get much worse for that hapless baitfish. Nematistius pectoralis occur in a limited area, mainly from Mexican waters south through Ecuador. For two or three seconds, I allowed line to pour unchecked from the reel, then gently eased the lever drag forward to the strike position. I waited for the line to tighten, and smiled as my rod bent in confirmation that the hook had indeed found its way into the sweet spot in the corner of the fish’s jaw. “Cinquenta!” shouted my captain a bit later, when he leaned over the side and grabbed my fish just ahead of its tail. Hoisting it aboard, he announced that I had indeed caught the 50-pound roosterfish he knew I so desperately wanted to catch. I could see that he was being overly generous, the fish weighing at best 40 pounds or so. I knew it wasn’t the 50-pounder I have sought for so many years now. Roosterfish, Nematistius ­pectoralis, inhabit the eastern Pacific, from the Baja Peninsula south to Peru. It’s the only species in the genus Nematistius and, with its iconic seven-stranded dorsal fin — like the rooster’s comb from which the species gets its name — the roosterfish is one of the most recognizable species of game fish. For a great many saltwater anglers, as for me, it’s a bucket-list species. Over the years, I have caught lots of roosters during numerous trips throughout Costa Rica and Panama. Often I have fished destinations where fish over 50 pounds are caught with some degree of regularity, but a 50-plus-pound trophy always seems to elude me. Are there ways I can fine-tune where, when and how I fish in order to maximize my chances of catching that elusive trophy rooster? Keen to put the odds as much in my favor as possible in my ongoing quest, recently I contacted several experts who regularly see big roosters caught in their waters. Roosters often feed in the surf zone around rocky outcroppings. Tucked into Piñas Bay in southern Panama, very close to the Colombia border, Tropic Star Lodge ranks as one of the world’s great fishing lodges. Numerous world-record roosters have been caught by anglers fishing these prolific waters, including the men’s 8-pound class, currently held by a 54-pound, 9-ounce rooster. “There is always a degree of luck to catching any trophy fish, but there are certainly things that anglers can do to increase their chances, namely look for the optimal time of year depending on area, baits and techniques,” says Capt. Richard White, Tropic Star’s fishing director and assistant manager. “In our waters, the best months for larger roosterfish are from April, when the water starts to become very clear, till around August. “Live bait is the best bet for larger roosterfish, especially hardtails [blue runners], mullet and bonito,” White continues. “Large roosterfish have such big mouths, a 50-pound rooster can easily engulf a large mullet or bonito. We swim live baits bridled with a circle hook. Smaller hooks are generally preferred, but you need a hook with a gape big enough to hook those larger fish. No lure, beats a live bait, with bridled blue runners such as this one being one of the roosterfish’s favorite hors d’oeuvres. Many roosters are taken on poppers and stickbaits worked along sandy beaches. Panama’s remote “tuna coast” on the Azuero Peninsula is home to Panafishing Lodge, another destination where trophy roosters are very much a house specialty. Demauge says that in their waters, “big roosters are much more likely to eat a live bait than a lure. We find that the big fish move around a lot, with no one spot consistently producing trophy fish. In our area, there is no such thing as ‘targeting a big rooster.’ We just fish a likely spot, have fun with whatever wants to bite, and sooner or later a big rooster will show. The unique, telltale “rooster comb” dorsal fin often slices the water behind a lure. Lures that can be worked fast produce best, he says, citing a 6- or 7-inch popper or stickbait worked energetically with short strokes and nonstop action as the most reliable lure for roosters there. However, at times, roosters can be reluctant to strike lures on top. Then it’s time to send down the jigs. “For the past few years, slow-jigging has proved a really effective and unexpected way to target trophy roosters. Fighting a big rooster on slow-jigging tackle is something that even the most experienced angler will remember! Perhaps no area is more renowned for its consistent roosterfishing than southern Costa Rica’s Matapalo Rock, on the west side of the Golfo Dulce, where this monster was caught from a Zancudo Lodge boat. Smith says the odds of bigger fish also increase when fishing pressure has eased off. Even when sailfishing offshore is hot, lots of anglers will take at least a day to fish nearshore for roosters. More anglers have probably caught their first roosterfish in the waters of Mexico than any other country, especially around the Baja Peninsula. The current International Game Fish Association all-tackle world record is held by a 114-pound fish that was caught at La Paz in 1960. A quick scan through the list of various line-class records reveals no fewer than a dozen current line-class rooster records from Baja. “We catch many roosterfish in June and July over 60 pounds,” says Grant Hartman, owner and head guide at Baja Anglers in Cabo. For their waters, Hartman says, live mullet or ­caballito (scads) produce the biggest fish, though big Pencil Poppers and similar lures also work. Large poppers such as this Halco Roosta Popper attract attention when fished at a modest pace. Global Perspective: Fish Those Lures! “Catching a big rooster on a lure has nothing to do with luck, only hard work and patience,” says Julien Lajournade, editor of the French global fishing magazine, Voyages De Pěche. Lajournade, who has caught his share of large roosters, notes: “More people fish with lures than bait at the lodges I have fished, and in recent years, a lot of very big fish have been caught with poppers, including trophy roosters exceeding 60 and even 80 pounds. “In my opinion,” Lajournade continues, “the best lures are big poppers. 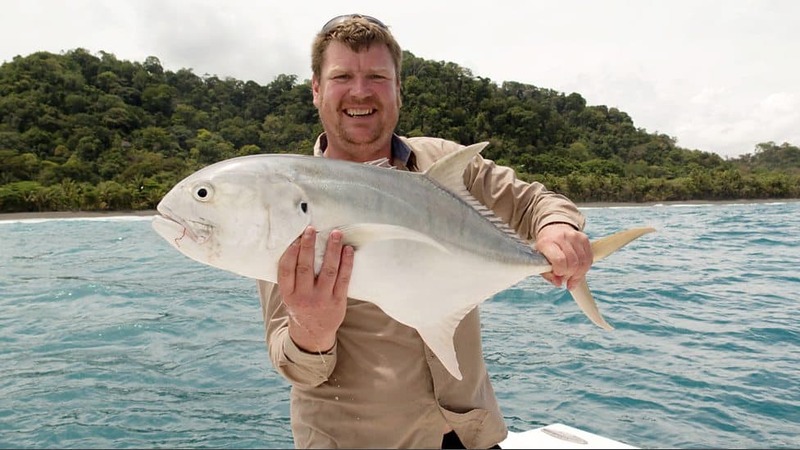 XL-size poppers made for giant trevally can fool monster roosters, especially in deep rocky places.” Lajournade favors a white belly with a light-blue back, rigged with a single strong treble hook at the rear. He attaches it to a 60-pound ­fluorocarbon leader. Most guides favor circle hooks both because they work so effectively and minimize release mortality. In addition to several ­countries already mentioned, Guatemala, Honduras, Nicaragua, El Salvador, Colombia, Ecuador and Peru all have roosterfish hunting in their inshore waters. Guatemala’s Pacific resorts widely seek roosters inshore as an alternative to the popular sailfishing offshore. The main issue when ­planning to fish in little-known or underdeveloped countries is finding a reliable outfitter who can arrange safe boats with knowledgeable crews. Following the recent cease-fire and peace agreement with the FARC terrorists, Colombia is already starting to attract an increasing number of sport fishermen; it certainly will become the next big Central American destination to draw anglers from around the globe — where, among other game fish, you can be sure they’ll target roosters. The work of Dave Lewis, a retired firefighter and U.K.-based angling photojournalist, appears regularly in publications around the world. He travels extensively, and acts as host and guide to groups of sport fishermen traveling to salt- and freshwater destinations (visit davelewisfishing.com). Why are fishermen so superstitious about making sure there are NO Bananas on board their boat while fishing in Costa Rica or any other region on Earth??? I did some serious research on this banana fishing myth, interviewed anglers, and even put bananas on our own boat to test out this theory. It turns out that “bad luck bananas on boats” is one of the oldest, longest running, and controversial fishing and boating superstition out there. But first, let’s cover the facts about fishing superstitions and bananas on board fishing vessels. I would even argue that fishermen and fisherwomen are perhaps the most superstitious group in America (besides the guy I see in the 7-11 convenient store that sits down on the ground Indian style every day as he scratches off his lotto tickets. Apparently he won $1,000 while sitting down Indian style with his legs crossed one time, and he thinks he must do it every time from now on to summon the good look fairy). But anywho…some of the craziest superstitions (always masked as reasons that the fish aren’t biting on your boat) seem to arise from anglers. Let me tell you my own true story of what happened the one (and only) time that we “accidentally allowed” a banana on board our boat down in Florida. It started off as a perfect summer morning in Marco Island, Florida back in 2000. We were down there with our incredible friends the Bentley Family, and the trip had been fantastic so far (mostly inshore fishing for snook and redfish). But today, we were headed offshore (going after big snook, cobia, and grouper) to a wreck that we heard from a trusted source was on fire! Clear skies, only a 20% chance of rain (which is an incredibly low percentage for Florida in the summer), and we were riding in our dad’s 3-year old 21ft custom flats boat made by Release. My dad, my brother Luke and I got an early start to catch some threadfin “greenback” bait fish as we were headed out about 20 miles to catch some lunkers. After just a few casts with our 12-foot cast net, we had enough bait fish for a few boats. In fact, we actually threw back over 40 baitfish from the second cast because we had so many. The live well was pumping salt water through a magnificent looking live well full of bait fish, we had a nice breeze, and we even had plenty of food and drinks (including a banana) to last us the entire day and then some. “What a heck of a start,” we thought as we headed out on the 20-mile stretch. As we finally approached the wreck, we were very pleased to see that we had it all to ourselves… not a single boat within sight in all directions. The live well was full of dead fish. Over a hundred of them. The water in the live well was there, but not a single baitfish was still alive from our 20-mile journey southwest… turns out that the intake got clogged and no new water was pumped in during the long trip out. So there we were, 20-miles out in a flats boat with nothing but dead fish in our livewell… a ruined day, three ticked off fishermen, and a banana. After debating about how the live well could have failed on our trusted boat that had never had an issue before, we noticed that the floor of the center console was covered with a thin layer of water that usually wasn’t there unless packed with people (the floor of the boat sits just barely above the water line, and when enough weight is added to the boat, water can be pushed up the drain pipes into the walking area). Given that it was only three of us without much gear, the only answer to that floorboard water is that a lot of water must have gotten into the hull of the boat… sure enough, we opened the hatch to the bottom hull and we had over 5 inches of water in there. Typically, the float switch on the bilge pump would ensure this never happened, but it somehow didn’t get activated. We have a manual switch to turn on the bilge pump, but that didn’t turn it on either… the bilge pump is dead! At this point, we faced a crisis. I tell you, five inches of water never seemed so scary when you are out in boat 20 miles away from the closest shore, with shark infested waters all around, and no other boats anywhere in sight. So we now had to cut open a Gatorade bottle to scoop out the water as fast as we could… hopefully, faster than it was coming in. After about twenty minutes scooping, we realized that however, the water got in there, it wasn’t coming in very fast anymore because our scoops were able to cut the level down… water issue no longer a threat. from the uncomfortable and exposed view on a 21ft flats boat on the open Gulf. We cut our losses for the day and gunned it back towards home while praying we could beat the storm. We got nailed by some of the thickest rain you have ever seen. And of course, we had no serious rain gear as we didn’t anticipate any rain according to the weather forecast that day (we blame it on the banana). The rain was so bad, and it was hitting us so hard, that we had to slow down. But as much as the rain hurt us like hail hitting a car, it took a back seat to our fear of the lighting. If you have ever been in the middle of a lightning storm, you know what I am talking about. Imagine three grown men screaming like little 10-year-old girls every time a big boom hit near us. It was one after another… booms, bolts, and shrieks from the Simonds’ bros and father. I dare say it was one of the scariest and most vulnerable moments of my life (besides my first prostate exam, but that is an entirely different story). After the longest boat ride back home of our lives, we finally see the channel marker for Caxambus Pass (south side of Marco Island), the rain finally dies down, the lighting has almost gone away completely, and we cry like little girls again (in a joyous way that we survived). The last few minutes into the idle zone to our dock were spent with the three of us wondering how everything had turned so negative so quickly. After a few minutes of debate, my dad mentioned the banana that we had on board. My dad still has the same 21ft Release and we all use it often. It has never had a banana on board since that day. It has also never had any livewell or bilge pump issues again, even though the boat is 14 years older. So call it what you will, but the Simonds will never forget that dreaded fishing trip where nothing went right. And you can be certain that we have a strict “No Bananas On Board” policy on all of our boats since then. The following “bad luck bananas on board boat myths” are in no particular order. They are based on years of banana research and interviews with fishermen from all over the world who claim bananas are bad luck on fishing boats. More specifically, crap-loads of spiders. I grew up in a house in Winter Haven, FL that actually had three banana trees on one side of our home. And do you know what could be found almost year round in and around those banana trees? For some reason, spiders love bananas. And I can only imagine that back in the day when shiploads of bananas were being brought over from Africa, they were loaded with small spiders. And do you know when spiders are most active? When they finally arrive in their destination port with a big chunk of their crew dead, you can see just how easy a rumor could spread that bananas were bad luck on board. Back in the 1700s and 1800s, there was no Coast Guard. And there certainly wasn’t high-frequency radio, cell phones, or any other way to call in for help or distress. So when a ship went down, it usually went down without anyone else knowing about it (except for the unlucky sailors on board). Of course, other vessels that were passing through the same shipping channels found many of these shipwrecks. Do you know what rises to the top of the water when a ship goes down? Anything that floats of course…including bananas! And when another ship came up to the spot that a ship had sunk, only to see a ton of bananas floating amongst the other debris, you can imagine how easy it would be to assume bananas were bad luck. When the sailors that came across the sunken ship went back to port, you better believe every story that was shared made mention of the floating bananas. Before you know it, that story gets passed on and elaborated upon until everyone in town believes that bananas caused the wreck. Have you ever left a banana at home while you went on a long vacation? I recall one time that I went away for a little over two weeks and came home to a horrible smell in my kitchen. I checked the trash cans, I checked the garbage disposal, and I checked to make sure my fridge hadn’t crashed and all of the food went bad while I was gone. But it wasn’t any of these culprits that were causing the wretched smell in my house. Almost blending into my black granite counter were two shriveled up, completely black, almost morphed together into one banana, rotten as can be, smelly bananas. It smelled as if something had died in my kitchen. And that smell was produced from only two bad bananas. Can you imagine what hundreds or even 1,000 bad bananas would smell like? Well, some sailors certainly did back in the 1700s. When a ship left with a cargo full of bananas, speed was key. The sailors knew that they only had so many days before the bananas would go bad, which meant their cargo would be worthless (thus they didn’t get paid). But what it also meant that when a bad storm, huge waves, getting lost at night due to the captain falling asleep at the helm (aka passing out after too much rum), or a variety of other reasons that things don’t go as planned on the ocean, was that the bananas on board began putting off an odor. And most people don’t know this, but the odor that bad bananas put out doesn’t just make your nose twitch, it also can kill other produce around it (the odor speeds up the time that other fresh food and produce goes bad). So when a ship would be out at sea longer than expected (thus they actually needed more food for the longer than expected voyage), yet the bad bananas were killing off much of their existing produce, many times the crew ran out of food. And if they were out at sea long enough, it could mean death. But even at best case, it meant a smelly, stressful, and a very malnourished trip. Not to mention, the stories the sailors came back with to their families and friends involved the mention of the “bad luck bananas”, furthering the “No Bananas on Board” superstition. Wood eating, banana loving, termites. Back in the 1700s, all boats were made of wood. And it was also said that some banana rich areas of Africa and the Caribbean had some of the most destructive wood-eating termites in the world. So you can imagine that sometimes these termites would cling to the banana trees as they were dragged across the land to the docks where they were loaded on the ship. And when the termites realized that they were now in an all wooden cargo hold, it was like a kid getting left in a candy store…aka Wood Heaven for a termite. Needless to say, the termites went to town on the wooden ship, causing tons of damage, and in some cases eating holes in the hull that were not repairable (as the sailors found out about the leaks way too late). Because many of the sailors wanted to blame the bad luck on something, the obvious patsy was the bananas, as they were the reason the termites had made it on board. As I mentioned earlier, speed was of the essence when moving bananas across the ocean. Another fact is that sailors on cargo ships loved to fish while at sea. And because most cargo ships took their time and went at normal speeds, the crew would take breaks to catch fish, and usually did quite well. But on the “Banana Boats”, they didn’t take breaks, and in most cases went full speed ahead to their destination. In most cases, way too fast to be trolling to catch fish. Crew members talk with other crew members from other boats, they realize that the banana boats seem to be the only ones that don’t catch fish, and thus a rumor is born. One sailor tells another that they never catch a single fish when a banana is on board, and before you know it, everyone believes the myth. Whether you believe in superstitions or not, it has hard to ignore the wild amount of fishing nightmares and instances of bad luck where bananas were on board the boat. However, it is also easy to see how easy these rumors of bananas being bad luck on board fishing boats can spread out of control. Fishermen and fisherwomen hate not catching fish, and blaming their bad fishing luck (or even boat problems or malfunctions) is something that has gone on for many generations of anglers. And as long as people keep bringing bananas on board boats, expect to keep hearing stories of how the banana ruined their fishing trip. The site of a billfish coming up into a spread of teasers, happily skipping across a deep blue ocean never gets old. Sailfish, named for their extremely tall dorsal fin and a sword-like bill, will light up in a purple hue when excited. They generally come into the teasers — which are hook-less lures that trail behind the boat to attract sailfish — gracefully swatting them with their bills. This gives you time to place your bait in front of it. A marlin looks similar to a sailfish, but they’re much larger. They also almost always bust through the ocean like a linebacker blitzing the quarterback, or a bull tearing through the ring at Christmastime in Zapote. The adrenaline rush of catching one of these fish is always rewarding, but it’s even better when you know you’re helping science learn a little more about these fish. 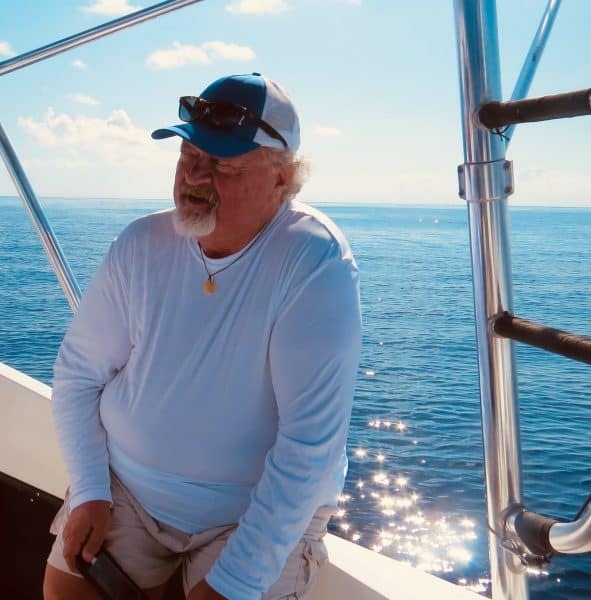 I recently helped a group of scientists, led by Dr. Larry Crowder from the Hopkins Marine Station at Stanford University, catch fish to better understand and manage ocean pelagics like sailfish and marlin. It was a good day for fishing and science. There was enough fish for the scientists to be selective with the ones they tagged. They placed satellite tags in three marlin and nine sailfish They chose the healthiest looking fish to place the tags. The tags cost around $4,000 a piece, so it pays to be careful. The tags they use have a “double loop” system which limits the drag in the water and keeps the tag close to the body. It’s black so predator fish won’t be attracted to it. The team several scientists from Stanford University, tagging experts and several local captains. The team of scientists were here to start-up a four-year project called Dynamic Marine Animal Research (DynaMAR) and are placing satellite tags on marlin and sailfish along several points off the Pacific coast. The tags will gather information on movement, location, depths traveled and water temperatures. They are set to pop off at intervals of, six, nine, and 12 months and float to the surface. Then an antenna will transmit the data to a satellite. Scientists will compare that data from other sources the fish have traveled to. They are especially interested in what these fish are doing during an El Niño period. During this period, the water warms and changes the upwelling of nutrients. The fish’s normal patterns change and they become more lethargic. They plan to tag fish every month of the year in future visits and hope to have data on nearly 150 billfish after they’re finished.Dr. Crowder says a similar study on swordfish of the coast of California changed the thinking on Marine Protected Areas (MPA’s). With the information they gathered from the swordfish study, they were not only able to predict where the concentration of swordfish would be, but more importantly, they could predict where the highest concentrations of bycatch would be. In that case, it was blue sharks and Leatherback turtles, a highly endangered marine reptile. That study led to the creation of Mobile Marine Protected Areas. By predicting the location of bycatch, areas could be closed to commercial swordfishing for a period and changed with the movements of the bycatch. This led to better conservation effort while allowing commercial fisherman a larger area to fish. Help Protect Costa Rica’s Billfish! Sign the Petition Against Illegal Fishing in Costa Rica! When Bart Miller died in 2018, he left behind a rich legacy as one of the sport’s most well-known fishermen-turned-lure-designers. His line of Black Bart lures has become the gold standard around the world for their ability to raise and catch marlin. Miller’s friends and longtime business partners, Jack Tullius and his brother Gary, continue that legacy as the current owners of Black Bart Lures. One of sport fishing’s most well-known lure-makers, Capt. Bart Miller believed that lures out-fish natural bait for marlin because of the lure’s action as it moves through the water. And yet for all the popularity of artificial lures, natural bait remains a top choice in many areas of the fishing world. Mark Pumo grew up fishing off Miami and the Bahamas. He started fishing some of the local billfish tournaments after college, where he noticed a need for high-quality natural baits. His team at Baitmasters of South Florida has become one of the sport’s top bait suppliers. If you’re pulling a ballyhoo, Spanish mackerel, mullet or squid in your spread, there is a pretty good chance it arrived to you in one of those distinctive yellow-and-black Baitmasters packs. To help better understand the specific benefits inherent to artificial lures and natural baits, we looked at a number of critical parameters. This is a head-to-head comparison: bait versus Bart. This is perhaps the most important factor to consider. If you’re chasing only blue or black marlin, then a spread of large, active lures fished on heavy tackle is hard to beat. However, if the target species include white marlin, sailfish and game fish, then bait may be a better choice. White marlin are especially notorious for their ability to whack even a small lure multiple times without finding the hook. In this case, a spread of chin-weighted ballyhoo fished on circle hooks is a much better option. From Southern California down to Cabo San Lucas, Mexico, teams pull artificial lures for striped marlin, but they almost always have a pitch bait ready, often a live or fresh-dead caballito already bridled and ready to go. If the marlin doesn’t hook up immediately, the bait is introduced to entice the fired-up stripey to switch over. It’s a tactic that allows the boat to cover territory as the crew searches for fish on the surface, while greatly improving their hookup ratio once they do raise a marlin. In the billfish-rich waters of Central America, natural bait reigns supreme. Deckhands may spend hours rigging hundreds of ballyhoo in anticipation of a great day offshore, with a few larger mackerel in case a blue marlin shows up in the spread. Where you fish has almost as much importance as the target species, and the two are certainly related. Specific locations in the world are almost exclusively dead-bait-centric locales, while others are the hallowed halls of lure fishing. 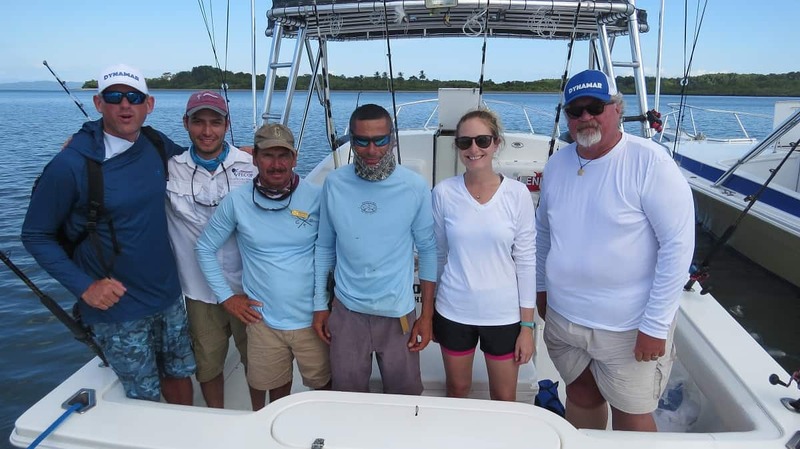 In Central America,the dead-bait ballyhoo spread is the bread and butter of the charter-boat and tournament crews, just as it is throughout the Carolinas and Florida. But venture to Bermuda or Hawaii, and the name of the game is lure fishing. This isn’t to say there is not some crossover: The Costa Rica captains will occasionally pull lures at the seamounts for blue marlin, and the smart Bermuda captains will have a pitch bait ready for a white marlin on the Challenger Bank, but in general, the destination will often dictate the tactics on the water. It has been said that you pull bait to fly flags and fish lures to cash checks, and there is some truth to that bit of dockside philosophy. If the goal is to pile up billfish releases in a tournament, it’s hard to beat a dead-bait spread. With circle hooks, most fish will be hooked in the corner of the jaw, and it’s much easier to hook and quickly release double- and tripleheaders of sailfish or white marlin on bait. But if only the largest blue or black on the dock wins the Happy Gilmore-size check, a big hunk of skirted resin is almost always a better bet. Natural baits offer a much higher hookup-to-release ratio than lures, especially when fished with circle hooks. While it does take experience and skill to become a really good lure fisherman, it’s also much easier for a relatively inexperienced team to start catching fish with lures (and a spread of five Black Barts fished at 8 knots is a pretty good start). Dead bait requires a higher level of skill, starting with the preparation. “Poor bait prep and sloppy rigging techniques mean that the bait will wash out quickly and not swim correctly,” Pumo says. “It takes dedication and lots of practice to gain proficiency as a dead-bait fisherman, but it’s also a great source of pride for those who achieve that level of ability.” Pumo also notes that Baitmasters offers expertly prepared, pre-rigged natural baits for those who may not have the time or experience to rig their own. The availability of high-quality natural bait in certain parts of the world is a big issue, often forcing teams to ship large quantities of frozen bait to a destination well ahead of time. Sometimes this isn’t an option, especially when overzealous customs officials become involved. I’ve even seen cases where ballyhoo is considered frozen food, even after we pointed out that it’s clearly labeled as bait on the package. On the other hand, it’s easy to pack a full spread of plugs in a soft-sided lure bag and take them with you anywhere in the world. “Natural bait also requires storage and refrigeration/freezer space, either on the boat or elsewhere,” Pumo says. “It has to be kept frozen solid until it’s ready to be rigged, and natural bait doesn’t last long once it’s thawed. Once the baits are rigged, they need to be kept cold but not in direct contact with fresh water or ice, which means a separate bait cooler or storage area on the boat.” Lures, of course, require no special treatment. Do you or your crew have the time to properly rig a full box of natural baits, or do you want to hop on the boat and go fishing? Rigging ballyhoo or mackerel is a process that involves carefully thawing, prepping and rigging dozens of baits, and it requires a host of miscellaneous small items like chin weights, waxed floss, O-rings or swivels, copper wire, rigging needles and more. Meanwhile, the same lures you pulled yesterday are ready to go today. Just check those hooks for sharpness, snap the leaders in the swivels and you’re all set. One main disadvantage of lures over bait is in the release ratio. Most lure fishermen will say that if they can maintain a hookup-to-release ratio of 70 percent or so, then that’s doing pretty well. Some boast of much higher percentages, but then again, there are also plenty of stories of rubber-hook days where teams are zero-for-4 on blue marlin, where the fish is hooked and pulling drag but manages to elude capture during the fight for whatever reason. Interestingly, the mandated shift to circle hooks with natural bait, enforced by the National Marine Fisheries Service, caused a complete shift in North Carolina’s tournament blue marlin fishery. 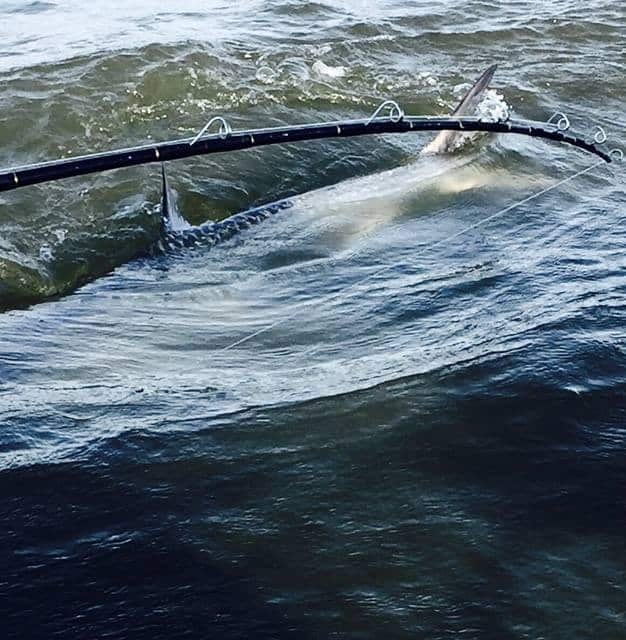 The standard Carolina marlin bait — a horse ballyhoo rigged on a J hook and fished in combination with a blue-and-white Ilander lure — was now illegal in tournament competition. Teams quickly learned to lure fish for big blues, while maintaining their prowess at dead-bait fishing for white marlin, yellowfin tuna and other species. Lures are great at raising fish and getting bites, but it’s hard to beat natural bait in getting a marlin to actually eat the damned thing. Much like a cat chasing a toy, a blue or black will sometimes bat a lure repeatedly in an attempt to catch, kill and eat it, often resulting in some spectacularly unsuccessful bites. If you free-spool the lure, it loses its action and the fish quickly loses interest. With a ballyhoo or mackerel, a short drop-back gives the marlin a chance to grab it, and since it looks and tastes real, they can turn and swallow it easily. And while they don’t chug and splash like lures, it’s hard to beat the realistic swimming action of a well-rigged mackerel, mullet or ballyhoo in the spread. This one’s a draw. With their aggressive head shapes, these lures will raise plenty of marlin, particularly in the noisy white water close to the boat. The food chain throughout their range, they are still susceptible to predation by a variety of larger species with indiscriminate diets. Near Australia’s Great Barrier Reef, crews deploying large baits for colossal black marlin sometimes include rigged wahoo, while in other parts of their range various billfish and pelagic sharks are among the few predators capable of successfully keeping pace with these speedy game fish. Wahoo can be difficult to pattern across much of their global range, with many encounters occurring at random. However, along the Eastern Seaboard and in The Bahamas their migrations are somewhat predictable and there are several methods by which these fish can be captured with relative consistency. In any scenario, wahoo are rarely caught on monofilament or fluorocarbon leader material, so wire or cable leaders are recommended. High-speed trolling at 15+ knots is a popular tactic in Florida and The Bahamas because it allows anglers to cover more water, but where there is one wahoo there are often others nearby. Burning fuel can be fun, but after finding the pack it’s a good idea to pull back the throttles and circle back to the same general area dragging horse ballyhoo or handcrafted strip baits. Planers are also effective in getting offerings below the surface where wahoo bites are more likely. Sailfish anglers often lose entire kite spreads when wahoo key in on lively surface baits like goggle eye and threadfin herring, which can also be deployed on downriggers when targeting ‘hoo. When floating debris or sargassum mats are encountered miles offshore, anglers also entice wahoo by dropping jigs deep beneath the shadows. Wahoo are highly migratory and maintain a presence in tropical and subtropical waters worldwide, roaming the Atlantic, Pacific and Indian oceans, including the Caribbean and Mediterranean seas. These impressive predators, like many pelagic game fish, spend much of their lives in search of ideal bands of water temperature with concentrations of forage. Unfortunately, tagging studies indicate that a wahoo’s migration pattern isn’t as simple as one would think. Wahoo can be caught virtually any day of the year around the state’s expansive coastline and throughout The Bahamas, though certain areas are more likely to produce these fish than others. Off Florida’s First Coast, anglers who fight the cold weather and rough seas common to the winter months find fast action 50 or more miles offshore near temperature breaks and changes in bottom contour. Along the state’s southeast coast and particularly in the Florida Keys, wahoo can be caught much closer to shore with a variety of tactics. Just outside the reef edge in roughly 100 to 300 feet of water, winter wahoo take advantage of the abundance of baitfish in the region. Wahoo are also present in the Gulf of Mexico, albeit much farther offshore. Here, distant oil rigs are known to have monster ‘hoo lurking nearby, while areas above abrupt changes in bottom contour also attract these delicious game fish. While the distant waters of the Bahamian Out Islands and Costa Rica produce quality catches every winter, the biggest wahoo in the world undeniably exist off Fiji and the French Polynesia. Members of the Scombridae family, which includes the most prized species of mackerel and tuna, wahoo bear a customary fish silhouette featuring two dorsal fins, a slender caudal peduncle and deeply forked tail. While all scombrids have comparable biological features, in terms of behavior and where it hunts and lives, wahoo are more similar to billfish and tuna than coastal cruising king mackerel. None (state, federal and Bahamian waters). Wahoo are among the most recognizable pelagic offshore game fish around the world, sporting a unique appearance that features dark blue, purple or even greenish coloration on their backs with silvery lower sides and bellies. These fish also have 24-30 wavy, vertical bars on their sides. In Florida’s surrounding offshore waters, just about any wahoo caught that eclipses the 40-pound mark is considered a trophy. However, these tenacious game fish are capable of growing much larger and regularly push 100 pounds throughout their range. Florida’s state record wahoo, caught near Marathon, weighed 139 pounds, while the world record captured near Cabo San Lucas, Mexico weighed in at 184 pounds. Similar to several other pelagic game fish, wahoo demonstrate very fast growth rates and relatively short life spans. Check out our recipe for grilled wahoo. The worldwide wahoo population is considered stable, though relatively unknown, and its conservation status is currently of little concern to fisheries managers. Though there are various protected areas throughout the wahoo’s range, there are limited species-specific conservation measures in place for these fish. In Florida, wahoo is one of many unregulated species, meaning there are no size limits and the bag limit is set at two fish per person, per day. Despite a lack of major threats, anglers should remain sensible when harvesting any fish. Armed with streamlined fusiform bodies, wahoo are perhaps the fastest game fish roaming the open ocean. Combined with considerable speed, razor-sharp teeth make these fish extremely proficient predators. Throughout much of their life cycles, wahoo feed on a variety of pelagic baitfish and squid, while mature specimens are capable of taking down small tuna, dolphin and more. Because wahoo possess rapid growth rates and are constantly on the move, these fish require a great deal of food and are almost always on the hunt. Hammerhead sharks are known for their unique head shape and wide-set eyes, which give them a better visual range than most other sharks, but there’s a lot more to learn about these distinctive fish than what you may already know. The “hammer” shape of this unique shark’s head is called a cephalofoil. FUN FACT The scientific genus name of most hammerhead sharks is Sphyrna, which comes from the Greek word for hammer. Some scientists have theorized that the hammer-like shape of the head may have evolved to enhance the shark’s vision. The hammerhead’s eyes are positioned on the sides of the shark’s flattened “hammer” head, which gives it 360-degree vision — in other words, the hammerhead can see above and below at all times. However, they have a huge blind spot directly in front of their nose. Unlike most sharks, hammerheads mostly swim in schools, sometimes numbering in the hundreds in places like Costa Rica’s Isla del Cocos and the Galapagos. At night, a hammerhead shark usually hunts alone. FUN FACT There are nine species of hammerhead sharks. The great hammerhead is the largest, and typically measures about 13 feet long and weighs about 500 pounds. A hammerhead scans the sand for its favorite meal, the stingray. SAD FACT Sharks are infamous for being labeled as the big, bad monsters of the sea, but there’s a monster out there that’s even more threatening — humans. Hammerheads are at a high risk for extinction because fishermen hunt them for their fins, which are considered a delicacy in some countries. After a hammerhead’s fin is sliced off, the fisherman will toss the creature back into the water. Unable to swim, the shark dies. Hammerheads are found worldwide. They generally prefer warmer waters along coastlines and continental shelves. FUN FACT Hammerheads are found in both shallow and deep water. During summer, you can find large schools migrating to cooler water. Because they often school in shallow water, they are one of the few animals that can actually tan from exposure to the sun. A hammerhead’s belly is white — this allows it to blend into the ocean when viewed from the bottom and enables it to sneak up on its prey. FUN FACT Like all sharks, hammerheads have electroreceptory sensory pores called ampullae of Lorenzini. Because of its unique head shape, the hammerhead can sweep the ocean floor for prey more effectively. Hammerheads trap stingrays by pinning them to the seafloor. FUN FACT Fossil records for most sharks are scant since they do not have mineralized bones. Usually, it is their fossilized teeth alone that are commonly found. According to scientists’ DNA studies, the ancestor of the hammerheads probably lived about 20 million years ago. Reproduction occurs only once a year for hammerhead sharks. FUN FACT A female hammerhead gives birth to live young. A single female can give birth to anywhere from six to 50 pups. Can I catch Tarpon in Costa Rica? 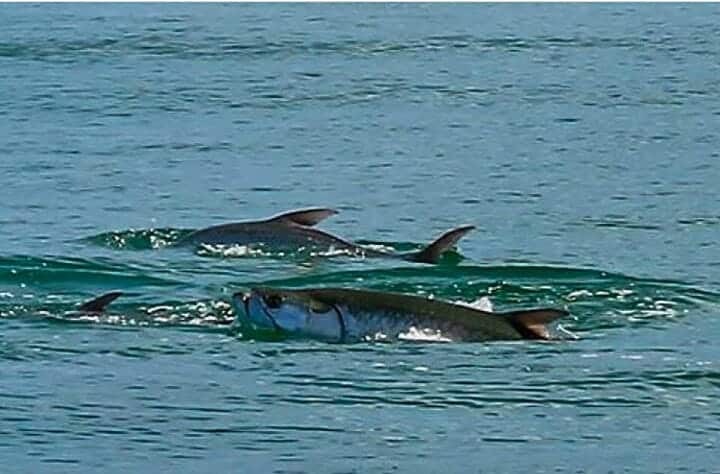 Yes, Costa Rica boasts some of the best tarpon fishing in the world, and they can be targeted year round. Historically the best tarpon fishing in Costa Rica is October and November. Occurs in warm temperate tropical and subtropical waters of the Atlantic Ocean. This coastal fish can be found both inshore and offshore. Because of its ability to gulp air directly into the air bladder by “rolling” at the surface, the tarpon is able to enter brackish and fresh waters that are stagnant and virtually depleted of oxygen. Such areas are relatively free of predators, thus offering a convenient refuge for the young. They may shed up to 12 million eggs. The eggs hatch at sea and the eel like larvae drift in shore where they undergo a metamorphosis, shrinking to half the size previously attained and taking on the more recognizable features of the tarpon as they begin to grow again. Tarpon, bonefish, ladyfish and eels all undergo a similar leptocephalus stage, but the first three fish all have forked tails even at the larval state, whereas the eel does not. Tarpon grow rather slowly and usually don’t reach maturity until they are six or seven years old and about 4 ft (1.2 m) long. There are some things you never grow tired of seeing — osprey diving for fish, dolphin herding mullet and tarpon cruising along the beach on a calm summer morning. You can keep your trout, snook and redfish. Nothing gets my blood pumping like the silver king of sportfish. It is usually about this time of year, when the fish are thick in Tampa Bay, that I call Kathy Guindon, the state’s tarpon guru, to learn something new about what I consider the most interesting fish in the world. Guindon, a biologist with the Florida Fish and Wildlife Conservation Commission, never lets me down. For starters, there are nearly 28,000 different fish, but only two species of tarpon. “Fishes were in fact the first vertebrates on earth and date back to the Paleozoic era — this makes fish older than the dinosaurs,” she said. So think about that this weekend if you rush out to see the new Jurassic World movie. The Jurassic and Triassic periods were part of the Mesozoic era that followed the Paleozoic. So while T-Rex may be long gone, we still have tarpon. The species, which can grow to be 8 feet long and weigh nearly 300 pounds, is currently found in the estuaries and coastal waters throughout the Caribbean Sea and Gulf of Mexico; in the eastern Atlantic and along the western coast of Africa. While the different species of fish have varied life spans ranging from a few weeks to more than 150 years, tarpon have pretty long lives. Tarpon in the wild can live well into their 50s. That’s pretty impressive considering that this species is on numerous predators’ menus. Fish-eating birds feed on young tarpon. Porpoises and alligators sometimes eat larger ones. But by far, the most dangerous predators are sharks. A big bull shark or great hammerhead can easily cut an adult tarpon in half with just one bite. Although sportsmen prize tarpon for their acrobatic leaps and fighting ability, this species was once hunted for food by the indigenous people of Florida, and South and Central America. Tarpon are scavengers and will eat just about anything. Despite their large size, they feed on surprisingly small organisms, including mullet, ladyfish, pinfish, grunts, crabs, threadfin herring, scaled sardines and even catfish. In case you are wondering, humans only have three types of cone cells. Throughout history, tarpon scales have been used as nail files, wall art and pulverized for medicinal purposes. Guindon participated in the last global stock assessment of tarpon in 2011 where she met a colleague from South America.